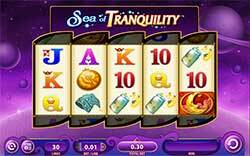 Set yourself up for some sweet dreams when you play the awesome 30-payline video slot Sea of Tranquility from WMS! This exquisite slot machine is a fan favourite is exactly what dreams are made of. The game is more relaxing than most but not so much that it lulls you to sleep. In fact, it is quite weird how a game can be so relaxing and stimulating at the same time! The symbols on the reels are expectedly in the dream-like fantasy style with things like a night cap, firebugs, owls, Sleep Princess, a man in the moon, a sailboat floating across clouds and card symbols ten through ace. It’s a really wonderful and peaceful game with features to bring the excitement level up a few notches. Dreamy Wilds – The green shooting star is the Wild symbol in this game and substitutes for all other symbols except the Man in the Moon Bonus, to complete winning combinations when possible. Moreover, the Wild expands to fill the entire reel which is fantastic for creating more winning opportunities. Man in the Moon Bonus – The Man in the Moon symbol is the bonus and will award free spins with multipliers. Hitting 2, 3, 4 or 5 Scattered symbols will award 7 free spins + 2x multiplier, 10 free spins + 5x multiplier, 20 free spins + 10x multiplier, 50 free spins + 25x multiplier. Close Enough Feature – When any Wild symbols or bonus game awarding Scatter symbols falls into one of the out of play yet just visible positions at the top and bottom of the reels, they can suddenly become part of the winning reel symbols. As such, if you have for example two scatter symbols in view on the game screen and a third is just out of view, the slot machine will decide that third required scatter symbol needed to trigger the bonus feature round is Close Enough and will then let it come in play and you will then instantly have triggered the bonus feature. If a Wild symbol lands in a just out of view position on the slot games screen the Close Enough feature may suddenly kick and when it does that Wild symbol will then come into play and will help you possibly form winning combinations on the base game screen even though it has landed just out of view!